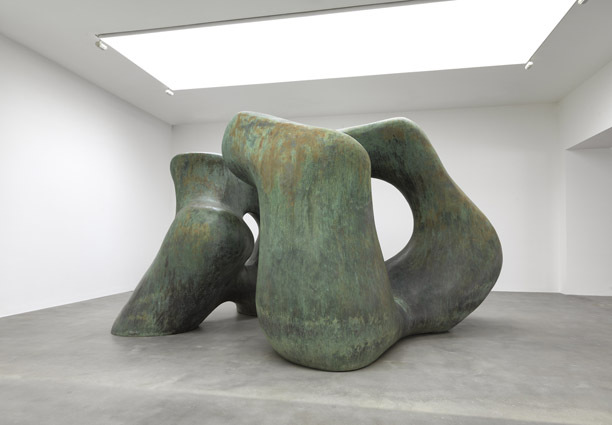 The English artist Henry Moore understood the power of BIG. 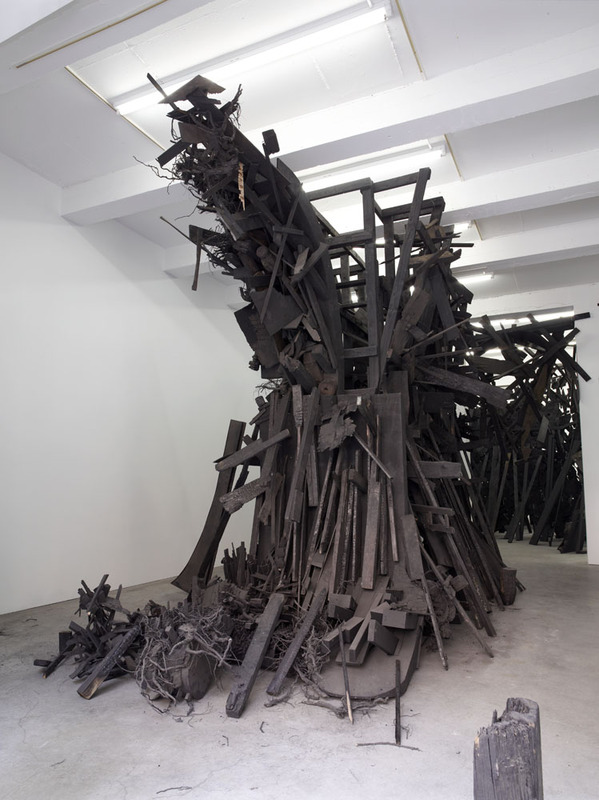 His sculptures on view at the Gagosian gallery in Chelsea are massive. Their organic shapes make them approachable and intuitively familiar. I was surprised to find some of the pieces were warm to the touch as they are made of bronze. They seem to have an internal energy that magnetically pulls the viewer close. 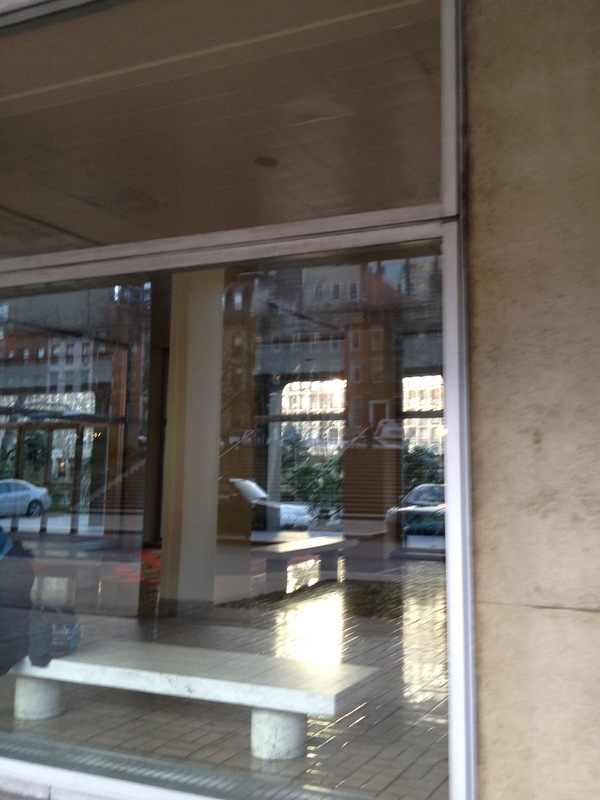 The most interactive of the pieces is located in the center of the gallery and is entitled " Large Two Forms.". One can stand in the middle of the sculpture and commune with your child or friend. You are momentarily suspended within the core of this strange and wonderful form. There is touching allowed ( Moore wanted it that way). A cabinet in the rear of the gallery space displays the studies for his pieces in a smaller size, organic forms like shells and bone that inspired him, and tools that he used to carve the miniatures. His powerful inspiration was the world around us and he succeeds in passing that feeling along to you. Perfect for all but watch the little ones as there is no climbing on the work, ( you too will be tempted). The exhibit runs through January 19th. Image above: "Large Two Forms,1966. Reproduced by permission of The Henry Moore Foundation. Photo by Mike Bruce. 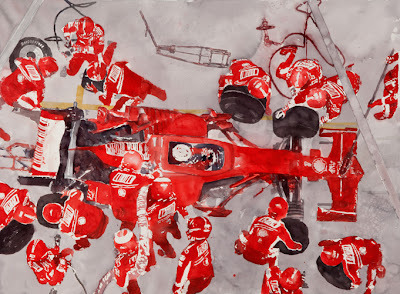 Courtesy of Gagosian Gallery". By now, we're all counting down the days to November 7th, and happy to see it end. It's been a grueling campaign but you can take the kids to an exhibit that speaks to the moment. 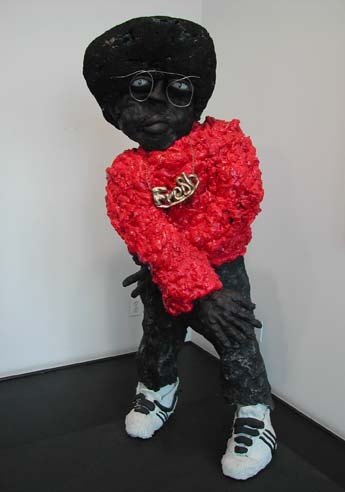 "Commander in Chief" an exhibit at CRG gallery in Chelsea, features sculptures and other mixed media by artist, Brain Tolle. Most of the works are representations of U.S. presidents in sculptural from. A bust of President Obama is crowned with a collector's set of miniature presidents that the artist purchased on ebay. The head of President, Abraham Lincoln, has red white and blue ribbons inscribed with the words from his two inaugural orations, shooting out of his eyes. A reminder of the power of his words and the violence of his death. The exhibit is up until November 10th and is perfect for 7 and up. Small children alert: lots of temptation to touch. It didn't take too much to effort pack my family in the car this weekend and drive to Beacon, New York to see the art at Dia:Beacon's Riggio Galleries. The beautiful fall weather and promises of apple cider sealed the deal. A trip with your family is could also include apple picking in the nearby groves. Fall festivals are advertised every where. A car is not necessary if you the take Metro-North Train at Grand Central Station or Harlem Station. Ask for the One-Day Getaway ticket to Beacon that includes a reduced admission fee to Dia:Beacon. General admission is $12 for adults, $ 10 for Seniors, $ 8 for students and children under 12 are free. The Galleries are spacious and filled with works by artists like John Chamberlain, Sol LeWitt, Imi Knobel, Jean-Luc Moulene, and Richard Serra to name just a few. The kids love the giant metal sculptures by Richard Serra that draw you in and gently set you on a path to find their center. Linger awhile and you may find yours. Top image: Child enjoying a Richard Serra sculpture. Now that school has begun you may find that one of the biggest hurdles is getting your child to organize and plan his or her homework and schedule. If the weekend finds you with a desire to let go and toss all that structure to the wind, take a trip to the Sikkema Jenkins art gallery in Chelsea, and get some inspiration. 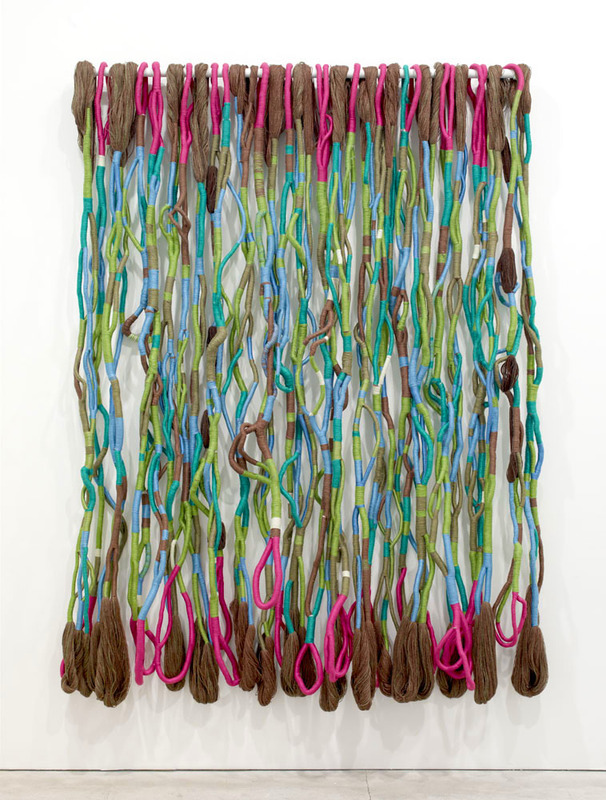 Check out the abstract sculptures currently on view, by artist Leonardo Drew. 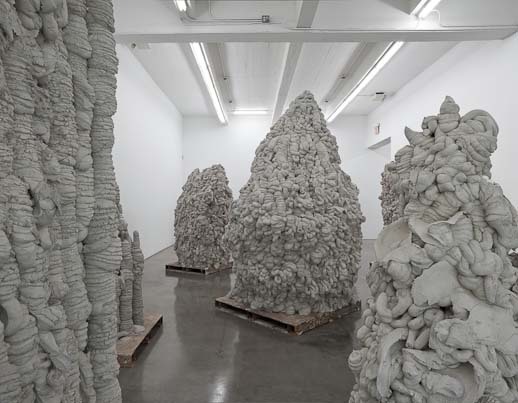 The largest sculpture installation, entitled "Number 161," snakes through the various rooms of the gallery. 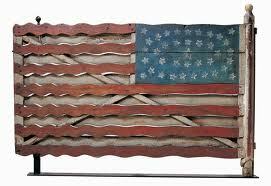 Wood chips, planks and boards, composed of brunt wood and paint are everywhere! Our group thought it looked liked the wreck of a blown up ark or sea ship that had washed up on the shores of the art gallery. "Everything is blown to a million pieces," said a young viewer. The artist took nearly an entire month to put together the sculpture and every chip is in its place but the feeling is of total chaos and catharsis. The other works by the artist are smaller but no less powerful as contrasting materials such as aluminum and wood are juxtaposed together to create a complicated marriage. Warning this exhibit may inspire some "... my homework blew up,'" excuses. This exhibit is up until October 12th. Perfect for older kids, teens and adults. Watch the little ones as they will be curious to explore. Our yearly visit to Woodstock is great for me as there is no shortage of art to see in the Hudson Valley. This year our trip coincided with the 10th Annual Saugerties Artists Studio Tours. It was hard to get the family out of the fresh water creeks but we finally made a stop at the sculpture park and museum, Opus 40. The art gallery at this site features representative pieces of all of the artists that are participating in the studio tours but the real star of the show is the sculpture garden itself. Described as an "earthwork sculpture" by Brendan Gill of Architectural Digest, Opus 40 is a marvel to experience. When you arrive at the site a person will ask you if you want to pay to tour the site on your own or just go to the Quarryman's Museum and art gallery. The correct answer is pay. Stop at the art gallery and watch the video that tells you the story of Harvey Fite the man who single handedly built Opus 40. Fite, a sculptor of wood and stone who founded the Fine Arts Division at Bard College brought the abandoned stone quarry to set up a studio and create an outdoor garden for his sculptures. Using Mayan building techniques to build the garden he soon became aware that the space itself was a new kind of sculpture. Your family will wander along the paths of blue stone and feel the coolness of the earth as the temperature drops a bit when following the various alleyways the sculpture garden has tucked in its structure. The Quarryman's Museum is filled to the brim with tools of the quarryman's trade. My daughter thought it was boy heaven, but I think the girls will dig it too. A truly unique and interactive experience. Perfect for all. Today I stopped by Madison Square Park located between Madison Avenue and 23rd street to see the interactive art installation "Pet Sounds," by California artist Charles Long. The mixed-media sculptures have been hanging out in the park for more than a month now and they seem well liked by all the passers by. The scorching heat kept most adults in the shade today, but the little ones gravitated enthusiastically to the biomorphic forms. There is a playground in the park if the kids want to start climbing the art. The installation will grace the park until September 9th, so there is still plenty of time to enjoy the soothing pet sounds and good vibrations these friendly forms emit. Dogma a group exhibition at Metro Pictures Gallery in Chelsea examines our age old relationship with dogs. The roster of artists include Martin Kippenberger, Mungo Thomson, William Wegman, Christopher Wool and Nina Beier to name a few. Nina Beier's piece is a performance in which a live dog plays dead on a Persian rug. The performance entitled Tragedy occurs at intervals throughout the exhibition. Calling in advance can give you an idea of when it will happen on a given day. There are plenty of other works that will mesmerize you. For example, the video by Wegman gets close enough to his subject (a dog of course) to see the space between the hairs on it's head. Perfect for most, although the younger children will need major supervising. The subject is summer and the photography exhibit "Summer 2012" at the Robin Rice gallery gets to the essence of the season. Ms. Rice the curator and owner of the gallery has put together a group show of new and established artists represented by the gallery. Each artist serves up a slice of summer that we can all enjoy regardless of whether we've experienced it or not. Take your kids before or after you go on your summer adventure and make the connections. Perfect for all. Exhibit runs through September 9th. 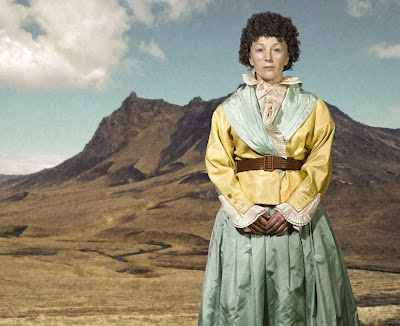 If you'd like to introduce your children to work of artist Cindy Sherman and want to pass on the exhibit at the MoMA, take them to Metro Pictures Gallery in Chelsea. You will find gorgeous images that are breathtaking in size. Ms. Sherman takes photographs of herself in scenarios that she creates with props, make-up and costumes in her studio. More recently she has used photoshop to create imaginary landscapes and digital techniques to manipulate her facial features. Her exploration of self through character creation is something that children instinctively do as they form their inner and outer lives. Ask your children what they see in her character's expressions, body language, dress and location and what it tells them about the character. As they view the photographs the they may imagine themselves as different characters and create their own fables. Perfect for all. Exhibit ends June 9th. 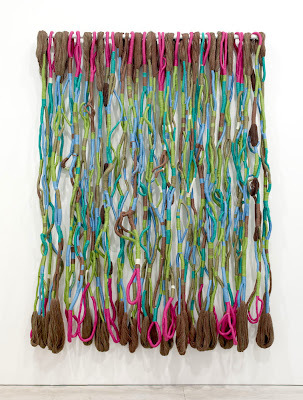 Fiber arts always sounds to me like arts and craft projects offered at summer camp but the work of fiber artist Sheila Hicks is anything but. The Sikkema Jenkins Gallery is currently showing an exhibit of some of her sculptures and smaller pieces. She weaves a world of wonder and forms made from cords of,cotton, linen, leather, steel, rubber and more. Some pieces tumble down from the ceiling like water and others are small, with intricately woven objects into the fibers, like feathers, porcupine quills and stones. Ms. Hicks has been at it for over 50 years and she is a master. The exhibit is up until June 2nd. Perfect for all. It's hard not to feel overwhelmed when you first encounter the new sculpture by artist Anish Kapoor on view at the Gladstone gallery on 21street. This massive metal egg shaped structure looks like it may have just landed from outer space. It's large opening allows you to look into it's cavernous emptiness. The adventurous may want to go in but the gallery thinks you better not. Its warm rust color and mysterious darkness takes up most of the gallery space and your mind. This exhibit is part of two part project. The second exhibition is at the Gladstone galleries 24th location. There you will find sculptures that have no form in the traditional sense but have taken on shapes on their own as all the layers of poured concrete kept on coming. Think a soft serve ice cream machine on the blitz. All the nooks and crannies are endless. Race cars, football players, car crashes are not typically subjects in watercolor paintings but the artist David Rathman is not going for traditional in his current show at the Larissa Goldston Gallery. Mr. Rathman focuses on competiveness in masculine contemporary culture. He also exhibits a 9 min short film made from story boards of cinematic watercolors called "Strange Arithmetic" an homage to the Old West and Spaghetti Westerns. Perfect for all with a big nod to your little sports fans. The show is up until May 12th. At last, an art exhibit that you won't have to keep your kids from touching or even climbing on. In fact you can take your shoes off and climb right on in with them. 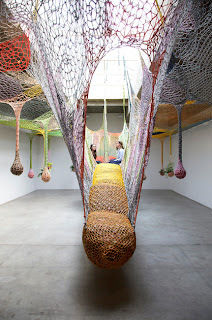 The Brazilian artist Ernesto Neto, presents his new sculptures at the Tanya Bonakdar Gallery, in an exhibit called "Slow iis Good." 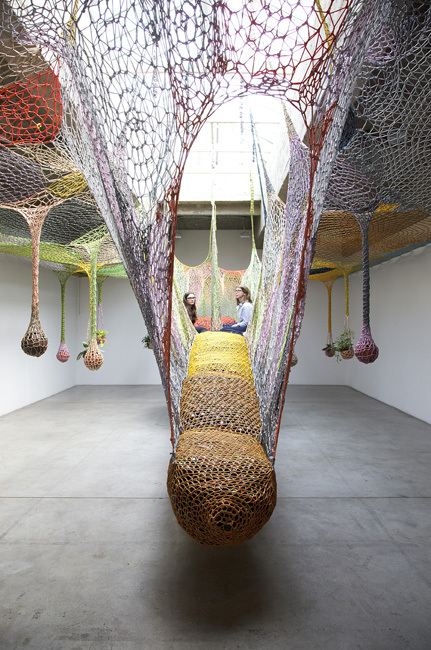 The sculptures were hand crocheted by a group of women in a small village in Brazil. Made from of polypropylene and polyester cord, they hang from the ceiling and are filled with small plastic balls at the bottom to form a path. You and your kids can sit and admire at the beautiful soft structures and their vibrant colors or just enjoy a walk within its form. 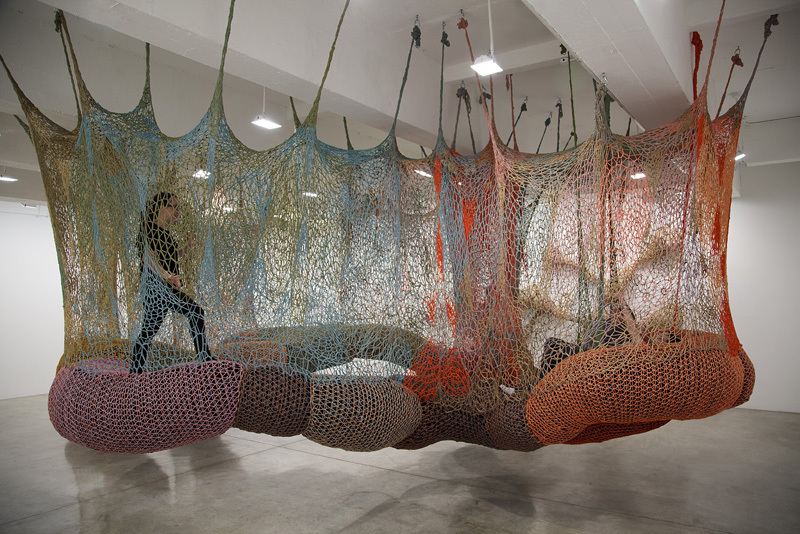 There are also other pieces on the second floor of the gallery that are like swings and large hammocks. The sculptures are very soothing to hangout in and you'll be tempted to take a nap. Slow is definitely good. Perfect for all. Only three people in the sculptures at a time. The ordinary activity of walking to and from our destinations is hardly anything to get excited about much less photograph, right? Wrong. In the current exhibit at the Pace Gallery, photographer Paul Graham captures the deluge of drama and details that surround us as we walk past each other on the streets of New York City. The diptych above shows a woman in the left image wearing a smiley face t-shirt and crying into her hand, while in the adjacent image she is gone, and another interesting person has taken her place. As in the streets of the city, the visual connection we make with the subjects are as fascinating as they are fleeting. Much of the work has been hung just inches from the floor, or at "street" level. This is a great plus for your smaller children, who can now really survey the scene. Perfect for all. Exhibit runs until April 21st. 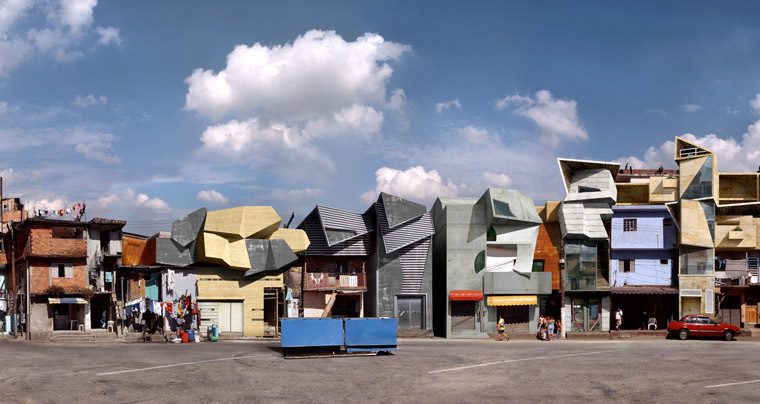 The photographer Dionisio Gonzalez can be considered to be a virtual architect. He digitally interweaves real and fictional images to create a new vision for his subject: the Favelas or shantytowns of Brazil. The grim reality of poor housing conditions and unemployment stands out with the imagined modern structural "renovations" that the artist has digitally created. They conspicuously sit side by side unbeknownst to the locals with only the brilliant sunlight to expose their improbable arrangement. Perfect for most. The exhibit is up until April 7th. 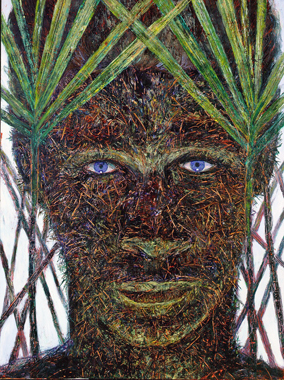 Galerie Richard 514 West 24th st.
with your children and watch their faces as they commune with the intimate portraits of a vanishing world. Perfect for all. Exhibit runs till May 19th. 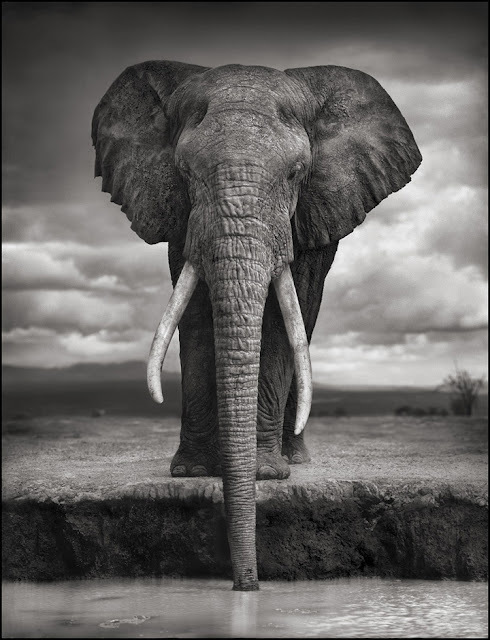 image: "Courtesy of Nick Brandt / Hasted Kraeutler, NYC"
Around the corner from Grandpa's house, we'd been watching this place go up for years and years. Finally it was done, and what a building it is! Maybe because we're always walking so close to it and the sidewalk is very narrow, or we're always distracted by each other, but I really just took a good look at this wavy wonder yesterday. 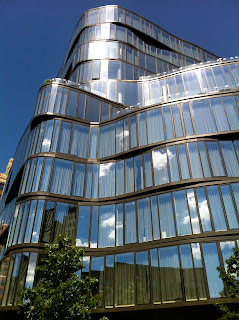 I stole the name "wavy wonder" from the blog Curbed, but its so catchy, I can't stop myself from using it. 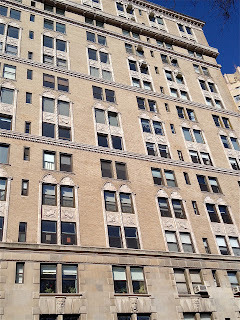 So, this building, One Jackson Square, is beautiful. The artist Roy Lichtenstein is primarily known for his pop art images inspired by comic strips and advertisements, from the 1950's. I wasn't aware of his later works inspired by Chinese landscapes, until I saw the current exhibit at the Gagosian gallery in Chelsea. 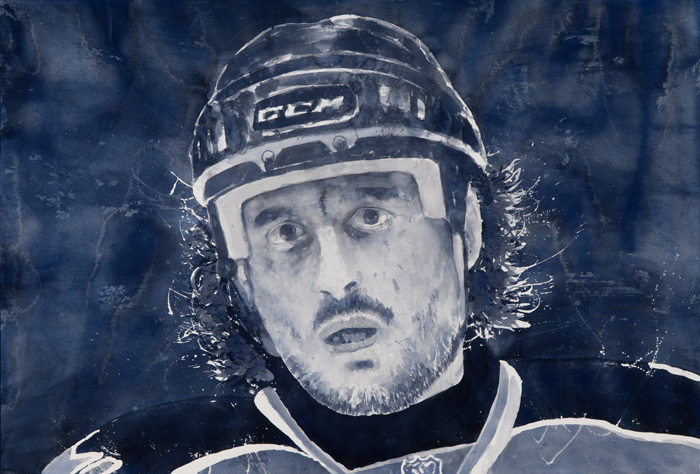 Most of the canvases are very large and all are done in his signature "benday style" (hand stenciled meticulously reproduced dots). In Chinese landscapes the sky water and land mysteriously cling together in a dreamy mist of brush strokes. Lichtenstein re-created this look by layering the canvas with blocks of dots in subtle colors and abstract forms. There are references to human life in the shape of very small boats or people that pop up in unexpected areas of the canvas. They look determined not to be swallowed up by the elements in the world they inhabit. Ask your children to find them and then marvel at how little color and line the artist needs to suggest a form or an object. The dots become more pronounced as you walk closer and closer to the image. Perfect for all. The exhibit is up until April 7th. Another artist interested in dramatic shifts in scale is Will Ryman. 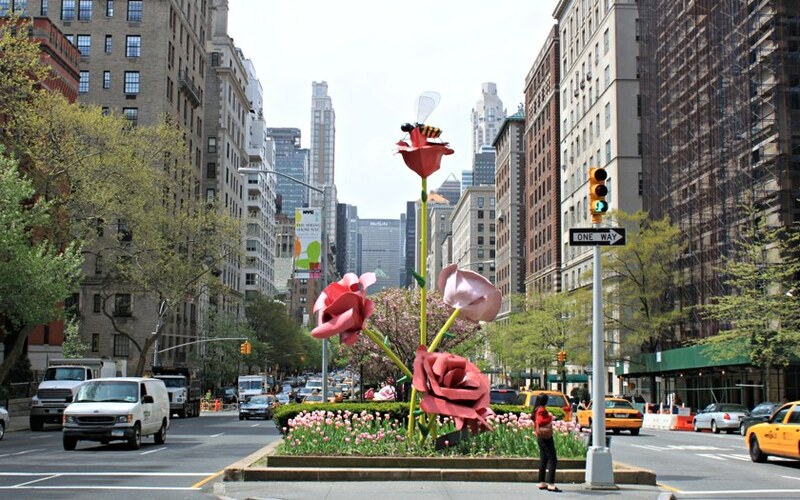 You may have seen his very tall roses sitting pretty all along the Park Avenue mall between 57th and 67th streets last year. Aptly called "The Roses," it brightened up the avenue with it's color and imaginative scale. His new exhibit at the Lio Malca gallery is called "Roses & Figures". 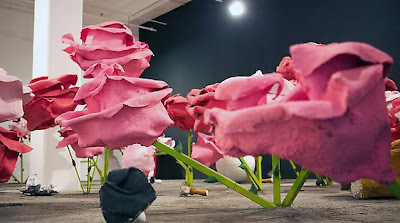 As soon as I went into the gallery I felt like I had lost my way in a bed of overgrown roses. Every thing including me was very close to the ground. Sculptures of cigarette butts, discarded soda cans, golf balls, were larger than life and littered amongst the even larger flowers. How Mr. Ryman made the fiberglass resin look so lush was on my mind when I came upon a gathering of some very hip looking dudes/sculptures. Cool, we're all hanging out in the VIP area of this garden party and passing on the funny lemonade. Perfect for all. Smaller children will have to be negotiated around the greenery. 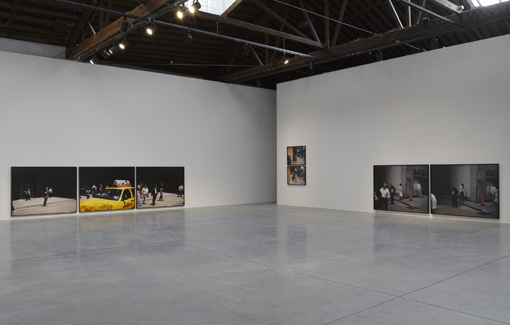 The Luhring Augustine Gallery in Chelsea features "New Work" by artist Tom Friedman. In this exhibit your perception is so skillfully skewed that you can't wait to get to the next piece to see what topsy turvy surprise you'll find. As I walked into the gallery I was greeted by a life-size sculpture of a pair of sneakers that were partially filled with legs that abruptly ended a few inches up from the shoe. It was as if the artist was asking me to finish the piece mentally. 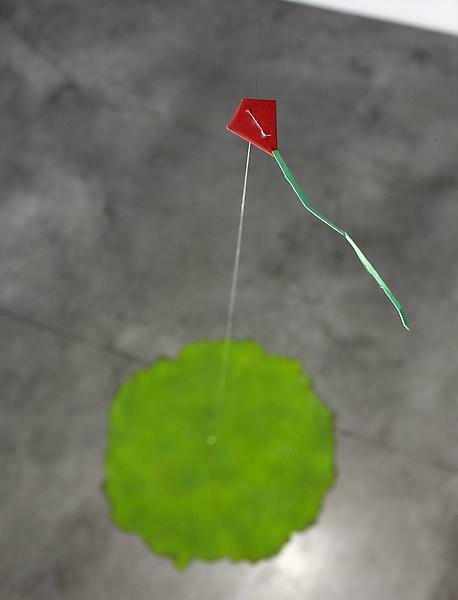 Another installation was of a tiny figurine of a man standing on a small patch of grass flying a kite. My sense of scale was doing flip flops as I looked down to see the tiny man then up again to view the kite. After doing that a few times I looked around for something to steady my eye on and I fixed on what looked a like blue space station with an endless amount of space refuse attached to it. The piece was hanging way up from the ceiling and the placement was strategic, of course. It made me feel really small and really desperate to get close enough to really see the little parts and gizmos. Eventually I moved on to a sculpture of a man made from stainless steel peeing on the floor. The figures stance was eerily real because the steel was so crumpled and relaxed looking .There are many more works in exhibit that will bend your mind. Perfect for your older children and teens. The work is up until March 17th. The Hotel El Convento in Old San Juan, Puerto Rico was a carmelite convent. It was built in the mid-1600s and now is a great building loaded with character and coquis chirping away in the plant-filled courtyard. The kids and I loved one particular detail. About every 20 feet on each of three or four extremely long wrap-around verandahs was placed a freestanding ashtray filled with sand on the top. 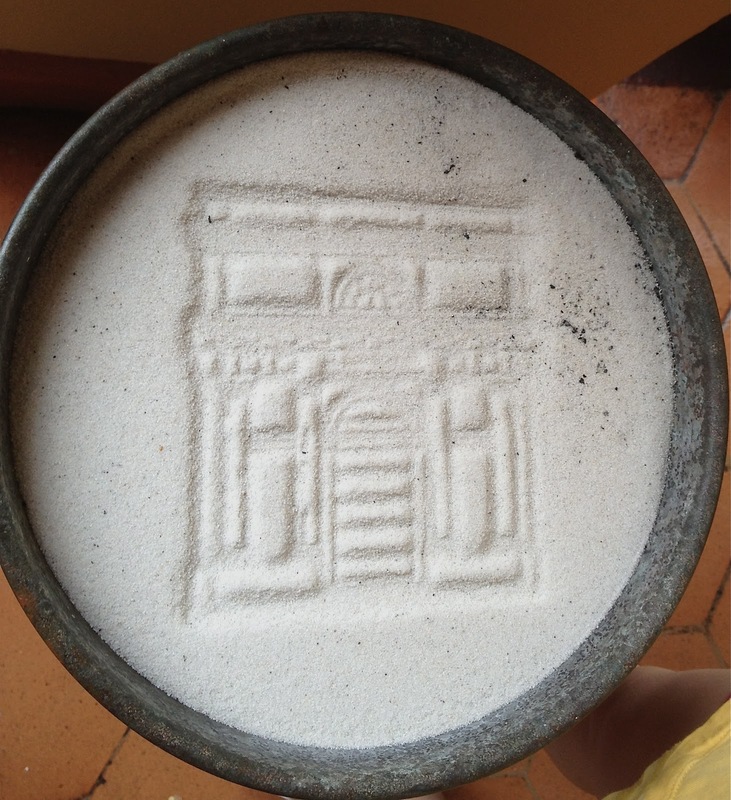 Pressed into the sand of each ashtray was an architectural rendering of the facade of El Convento. We loved that and despite the temptation, particularly on the part of a certain 7 year old young lady, I never let them mess it up. goARCHkids: Did Your Kid Read All Those Lightning Thief Books? Mine did and continues to be totally obsessed with Greek and Roman mythology. There are worse things. Particularly since I have no trouble piquing his interest with my classical architecture chatter. 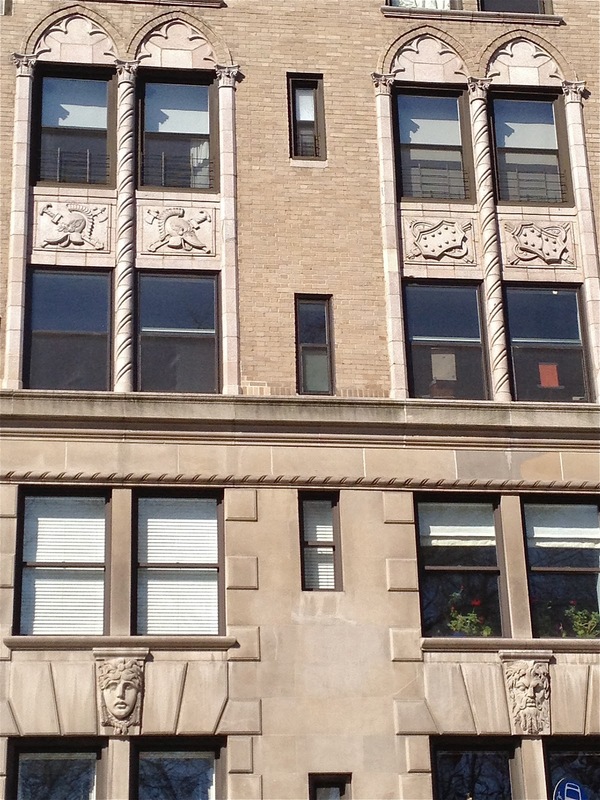 Cruising up CPW and he noticed that one of the buildings was sporting a decorative motif of what appeared to him to be Zeus and Hera. I couldn't really argue since he is the clear authority in our family. Nevertheless, I did. 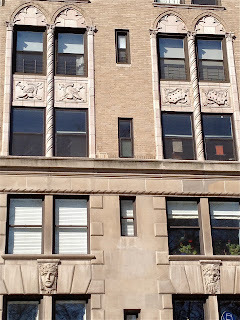 He ended up proving something when he noticed that right above the sculptural relief faces, there were shields and what looked to him to be obviously Spartan helmets. I love that he's looking at buildings and finding things that that he connects to. Next question: why did the architect chose this theme for this building? 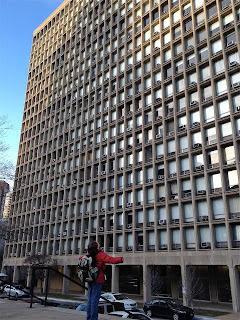 Unable to resist admiring another great Brutalist masterpiece, I made the children pause and take in the enormity of the Kips Bay Tower, designed by the renowned I.M. Pei. Pei is also responsible for the Javits Center, which is pretty yucky (and I can find a good word to say about most buildings), the soaring East Wing of the National Gallery in D.C. and the pyramid entrance of the Louvre. Pei has gotten around over the years and experimented with styles. 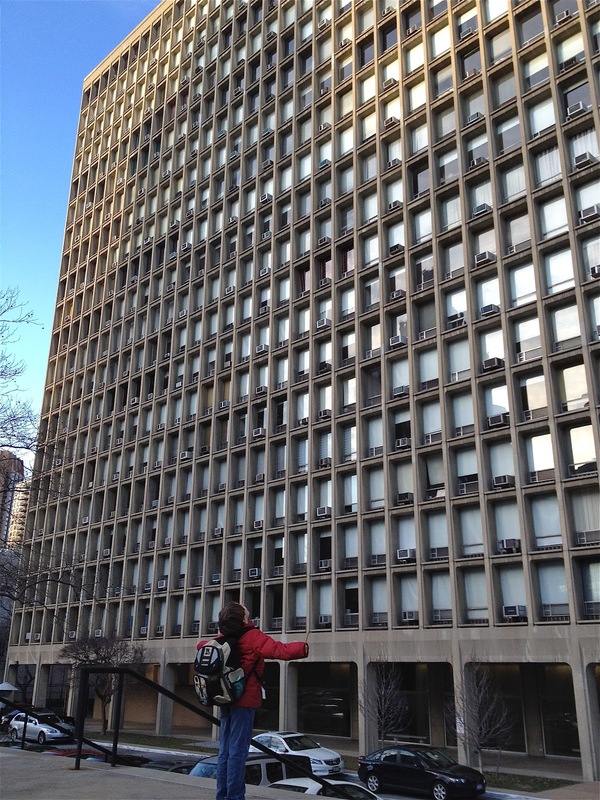 The Kips Bay Tower was done in 1965, a great time for the edginess of this new movement in architecture: Brutalism. 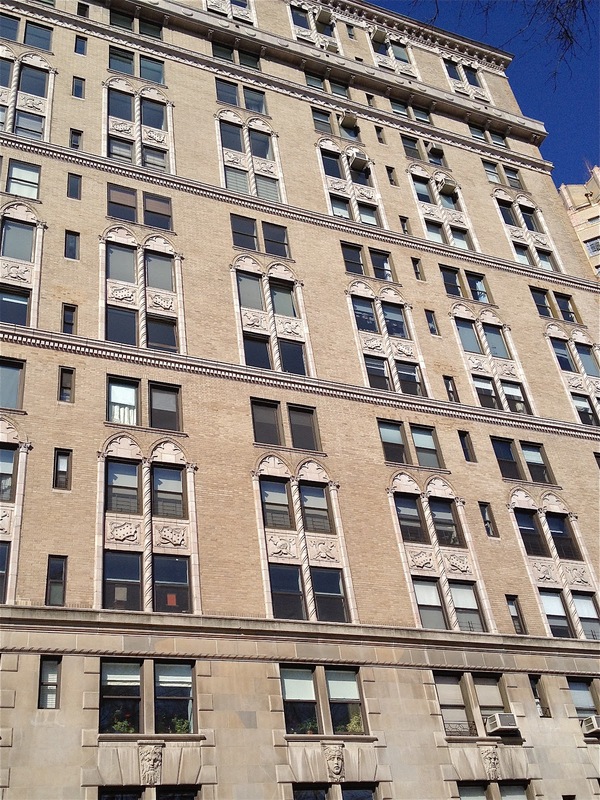 The building at 330 East 30th is enormous. The scale of the thing and the fact that it is set well away from the sidewalk make it seem like a giant monster with a thousand square eyes. Down, underneath the bulk of it, the lobbies are wide, airy places with benches and human-scale elements. But strolling by Kips Bay Tower is a great opportunity to pause, look up and be awed. Every first Saturday The American Folk Art Museum offers a kid-friendly tour of the exhibits followed by an art making project inspired by the collections. The program lasts an hour and starts at 1 p.m. Children ages 4-12 can participate and admission is free. When I was a child I played an imaginary globe trotting game by closing my eyes and letting my finger land on a spot on our spinning globe. The exotic names of faraway places sparked my imagination. The endless places I could visit left me excited and overwhelmed. 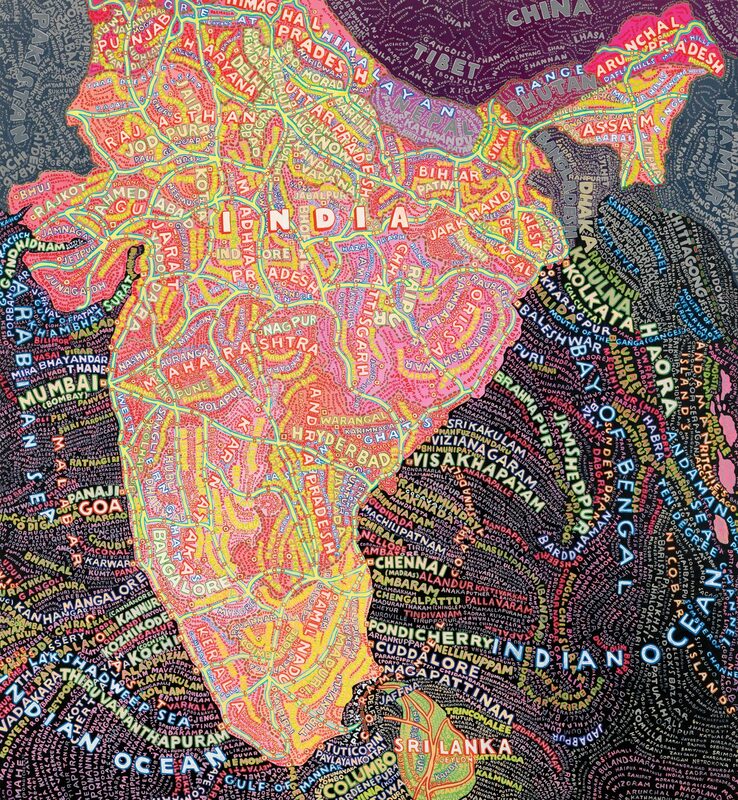 At the Bryce Wolkowitz gallery, artist Paula Scher plays with the idea of the visual and informational overload in our society and world. 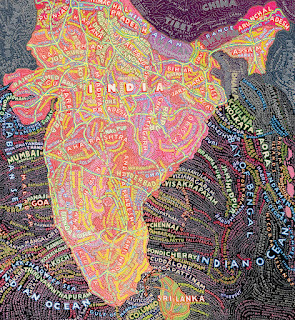 Ms. Scher's attempts to harness information by choosing cartography as the visual subject. Her intricate paintings/maps attempt to name every street, road, highway, town, city, state, county, hotel, library, historical landmark, that she can fit on to the canvas, in hopes of getting it all accounted for. The job is enormous and it looks like she's hasn't missed a thing. When stepping back to look at the large canvases the lines of the streets, roads and highways, countries, continents and meridians, form a beautiful matrix of vibrating colors that pulsate like a giant circulatory system in a living breathing world. The exhibit is up until February 18th. Perfect for all.